PHILADELPHIA — The next wave of clean-energy innovation will require collaboration as well as competition, says a researcher for the Near Zero energy policy advocacy group. Speaking at a lecture series sponsored by the University of Pennsylvania’s Kleinman Center for Energy Policy last week, Dan Sanchez, a postdoctoral scholar at the Carnegie Institution for Science, said sharing intellectual property and allowing open access to research data are catalysts necessary for growth in the clean energy industry. “There’s actually some really strong empirical work that shows that connectivity between the private sector and the public sector really does improve innovation outcomes and really does improve the chances that publicly funded research results in commercially successful products,” he said. Sanchez focused his argument on two initiatives, one an institutional effort and the other creating a roadmap for successful implementation of technology. 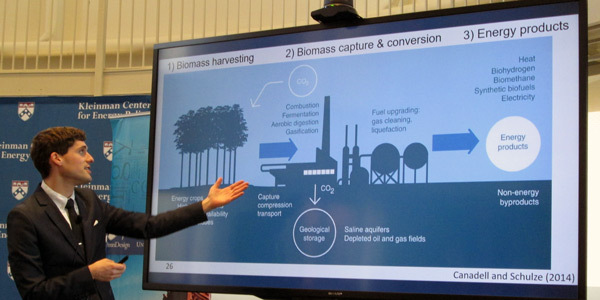 The technological initiative focused on developments in bio-energy with carbon capture and storage (BECCS). The institutional effort focused on Mission Innovation, a 23-country commitment established in 2015 to double their annual combined public funding of clean-energy research and development from $15 billion per year to $30 billion per year by 2021. He identified three “waves” of clean-energy investment in the past 70 years that failed to take hold permanently: nuclear energy following World War II; nuclear, renewables and energy efficiency in response to the oil crisis of the 1970s; and renewables, carbon sequestration, efficiency and grid upgrades in the 2000s. Following each spurt of investment, there was a “dramatic retrenchment” in private funding as projects failed to deliver on their promises, he said. Sanchez sees Mission Innovation having the potential to spur a fourth investment wave and says a clear, consistent path will be necessary to sustain it. That will include a centralized, independent headquarters, along with public visibility of R&D expenditures and better coordination among countries. For example, the U.S. and China have been collaborating for the past eight years on clean energy research centers, but in the past five years, no joint patents have been filed nor have any projects truly been jointly funded, Sanchez said. “Essentially, the U.S. funded their technologies; China funded their technologies. They shared a little bit of information, but it really wasn’t joint, collaborative R&D in the way we’d really like to see,” Sanchez said. Sanchez focused on BECCS as a likely candidate for the next investment wave. He pointed out that just one facility in the world — an Archer Daniels Midland corn-to-ethanol plant in Decatur, Ill. — is employing the technology to sequester about 1 million tons of carbon dioxide a year, accounting for about 1/10,000th of the worldwide reductions that are estimated to be necessary. “It’s fair to say there’s a very large gap between where we want to be and where we are right now,” he said. Critics have said experimenting with sequestration could delay deployment of emissions technologies and even provide tacit acceptance of additional emissions. But Sanchez said that perspective misses the “market opportunity” that could be created by planning the development and deployment of the technology — essentially creating a roadmap for its successful implementation. He pointed to gasification of coal and biomass as technologies with high commercial potential because of their ability to balance carbon-reduction product costs and scale facilities. However, the necessary research will require collaboration among public and private organizations. He offered as a successful model the National Nanotechnology Initiative, which coordinates the work of 13 federal agencies and industry groups in addition to performing regulatory and public outreach. Much work remains to help Connecticut maintain its leadership position, speakers said at the annual Energy, Environment and Development Conference. Here’s some of highlights of what RTO Insider heard at the Alliance for Clean Energy New York’s 10th Annual Conference.